HARRISBURG (PA) DAILY PATRIOT, June 4, 1889, p. 3. A Visit to the Senate Press Gallery -- Reminiscences -- The Olds Days of Reconstruction -- Trying to Write a Book. "The Fellow that Looks Like Me." I met Mark Twain the other day [w]andering around the capitol, and looking at pictures fifty years old as if they were new and inspecting with the interest of a rustic stranger the vivid bronze doors whose Columbian glories had [b]leared his eyeballs more than two decades ago. He strayed into the Press Gallery, threw back his gray overcoat, adjusted his gold spectacles on his nose and looked around. "A good deal changed," he said, glancing at the life size photographs of Whitelaw Reid and younger editors which now decorate the walls, "and it seems a hundred years ago." I asked when he was here. "I had a seat in the Press Gallery," he meditated, "let's see -- in 1867 -- and now I supposed all the veterans are gone -- all the newspaper fellows who were here when I was, Reid and Horace White and Ramsdell and Adams and Townsend." "The ones you name happen all to be gone," I admitted, "some to the control of newspapers and some to the place where Dr. Potter says there are no newspapers, but some of the real veterans are still here. On those pegs in the corner some of the ancients still hang up their coats -- Gen. Boynton and Byington and Uriah Painter and Judge Noah, the King of the Jews and Dean of the corps. Most of the old fellows are dead -- Whitely of the Herald, Crouse of the Times, Adams of the World, Henry of the Tribune, Cobright of the Associated Press. Jim Young is Executive Clerk of the Senate, John Russell Young is journalist at large, Ed. Stedman has grown to be the banker poet, and Henry Villard -- well, you know all about him and his fortunes." "Yes; some of these men I never knew in Washington; a few of them were here before my time. In fact, I was rather new and shy, and I did not mingle in the festivities of Newspaper Row. Probably most of the men you mention were perfectly unconscious of my existence. The Morning Call and Virginia City Enterprise did not make much of a commotion in the United States." "I roomed in a house which also sheltered George Alfred Townsend, Ramsdell, George Adams, and Riley of the San Francisco Alta. I represented the Virginia (Nevada) Enterprise. Also, I was private secretary to Senator Stewart, but a capabler man did the work. A little later, that winter, William Swinton and I housed together. Swinton invented the idea -- at least it was new to me -- of manifolding correspondence, I mean of sending duplicates of a letter to various widely separated newspapers. We projected an extensive business; but for some reason or other we took it out in dreaming -- never really tried it." Here Mark walked into the gallery and looked down on the vacant Senatorial seats. "I was here last," he went on, "in 1868. I had been on that lark to the Mediterranean and had written a few letters to the San Francisco Alta that had been copied past all calculation and to my utter astonishment, and a publisher wanted a book. I came back here to write it." "Why, I was offered an office in that ancient time, by the California Senators, -- minister to China. Think of that! It wasn't a time when they hunted around for competent people. No, only one qualification was required: You must please Andy Johnson and the Senate. Nearly anybody could please one of them, but to please both -- well, it took an angel to do that. However, I declined to toy for the prize. I hadn't anything against the Chinese, and besides, we couldn't spare any angels then." "A pretty good place to write," I remarked as we took seats. "Some things," he said, "but an awfully bad place for a newspaper man to write a book; or, at any rate, for such a newspaper man as I was to write such a book as the publisher demanded. I tried it hard, but my chum was a story-teller, and both he and the stove smoked incessantly. 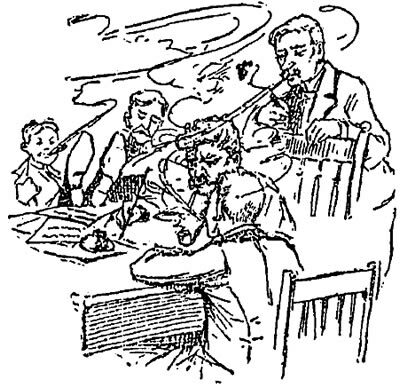 And as we were located handy for the boys to run in, the room was always full of the boys, who leaned back in my chairs, put their feet complacently on my manuscript and smoked till I could not breathe." "Is that the way you wrote Innocents Abroad?" I asked. "No; that is the way I didn't write it. My publisher prodded me for copy which I couldn't produce, till at last I arose and kicked Washington behind me and ran off to San Francisco. There I got elbow-room and quiet." "Yes, I know, I know," broke in Clemens, "but don't tantalize me. Do you take a fiendish enjoyment in making me suffer? I know perfectly well what I am about, and I appreciate what I am losing. Washington is no doubt the boss town in the country for a man to live who wants to get all the pleasure he can in a given number of months. But I wasn't built that way. I don't want the earth at one gulp. All of us are always losing some pleasure that we might have if we could be everywhere at once. "I lose Washington, for instance, for the privilege of saving my life. My doctor told me that if I wanted my three score and ten, I must go to bed early, keep out of social excitements and behave myself. You can't do that in Washington. Nobody does. Look at John Hay. Just fading away, I have no doubt, amid these scenes of mad revelry. My wife, you know, is practically an invalid, too, so that neither of us could keep up with the procession. No, the best place for us is quiet and beautiful Hartford, though there is a good deal of the society of Washington that I should delight in." "I supposed you have been pirated a good deal," I said to Mr. Clemens. "I do not mean by illegal publication of your works, but by private individuals claiming to write your writings?" "But I haven't been bothered that way so much as I have by personators. In a good many places men have appeared, represented that they were Mark Twain and have corroborated the claim by borrowing money and immediately disappearing. Such personators do not always borrow money. Sometimes they seem to be actuated by a sort of idiotic vanity. "Why, a fellow stopped at a hotel in an English city, registered as Mark Twain, struck up an acquaintance with the landlord and guests, recited for them and was about to accept a public dinner of welcome to city, when some mere accident exposed him. Yet I myself had stopped for weeks at that same inn and was well known to the landlord and citizens. His effrontery was amazing." "I do not know. I hope and believe that he did not. Parties whom I have since been inclined to regard as my enemies had the indecency to say that he did." "The same thing happened in Boston and several other cities. It was not pleasant to have bills coming in for money lent to me in Albany, Charleston, Mexico. Honolulu, and other places, and my calm explanation that I was not there bringing sarcastic letters in reply with 'Oh, of course not! I didn't see you with my own eyes did I?' etc., and I resolved that I would follow up the next swindler I heard of. I had not long to wait. A dispatch came from Des Moines, Iowa:"
" 'Is Mark Twain at home?' "
" 'Yes, I am here and have not been away.' I answered." " 'Man personated you -- got $250 from audience -- shall I catch him?' came back, bearing the signature of a lawyer. "He was a good while catching him -- some weeks -- perhaps months, and then he made me an elaborate report giving the route of his labyrinthine and serpentine chase of the swindler, the money he had expended, and the information that he did not entirely and completely catch him, though he 'got near him several times.' I was out some hundreds of dollars.
" 'Man swindled audience with pretended lecture here last night, claiming to be you. What shall we do? I telegraphed back unanimously, 'Let him go! Let him go!" "I'd give $100 thought to see one of these doppel-gangers who personate me before an audience, just to see what they look like." Mark Twain goes to Washington to work for the passage of an international copyright law in conjunction with Edward Eggleston, Gilder and other authors. Senator Reagan, of Texas, a friend of Mark's but an opponent of his pet measure, greeted him cordially last Winter with "How are you, Mark? How are you? Right glad to see you! Glad to see you! Hope to see you here every session as long as you live!" "MARK HIS GRACEFUL POSE" One of Mark Twain's favorite amusements in Washington is turning himself into an amateur guide and explaining to his friends the various objects of interest in the Capitol. He is particularly facetious over the pictures in the rotunda and the stone people in "Statuary Hall." 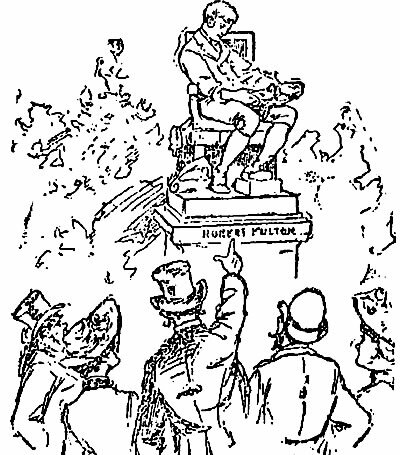 Arriving opposite the marble statue of Fulton, seated, and intently examining the model of a steamboat in his hands, he indulges in a wide-sweeping gesture and exclaims: "This, ladies and gentlemen, is Pennsylvania's favorite son, Robert Fulton. Observe his easy and unconventional attitude. Notice his serene and contented expression, caught by the artist at the moment when he made up his mind to steal John Fitch's steamboat." The humorist dresses a good deal more carefully than formerly, this is made necessary by his increasing amplitude, by his vast shock of grey hair, by his boisterous and ungovernable moustache, and by his turbulent eyebrows that cover his grey eyes like a dissolute thatch. And when he talks he talks slowly and extracts each of his vowels with a corkscrew twist that would make even the announcement of a funeral sound like a joke.